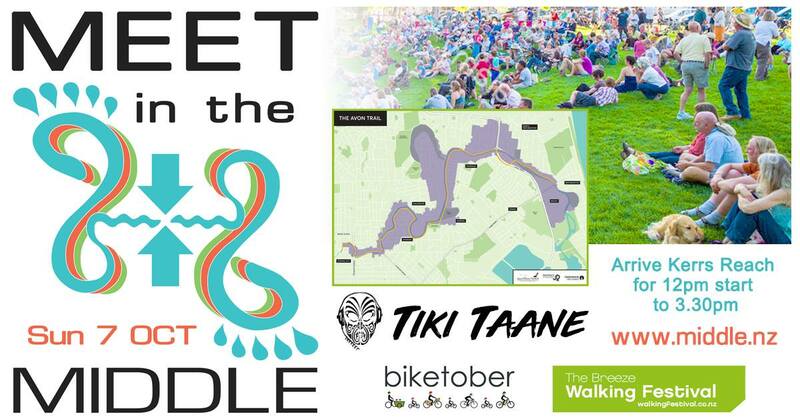 ‘Meet in the Middle’ on Sunday 07 October 2018 celebrates Te Ara Ōtākaro, the transitional city-to-sea Avon River Trail and its role in the regeneration of the east. This is an invitation to the people of Christchurch to come along the trail on foot or bike from either direction (city or sea) and meet in the middle at Kerrs Reach for a riverside family fun day with kids activities, food, beverage and info stands, a multi-code exhibition regatta, as well as FREE live entertainment on stage 12-3pm. TIKI TAANE will be headlining our stage, returning to his hometown to perform his powerful and uplifting “One Man Band” show! It will be a great day along the river in the red zone – experience the new buzz in the Ōtākaro Avon River Corridor! – Your whānau/family – please keep all dogs on a lead and under control at all times. – Waterproof blanket to sit on. – There is a bike park for cyclists: please bring your own bike lock. – Event takes place rain or shine! So pack appropriate clothing, hats, sunblock. Part of the Breeze Walking Festival and Biketober.